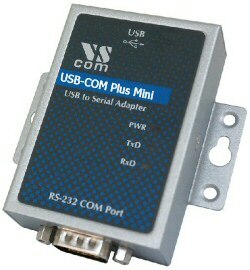 The Industrial USB to serial adapters of the Plus Line provide RS232/422/485 ports (three way operation). They are complete jumperless, configuration is done by easy-to-use DIP switches. With four and eight serial ports the configuration is additionally possible by a configuration software. All support highly flexible and high speed RS232/422/485 operation, including internal termination in RS485. The ports provide standard DSub-9 male connectors, the metal cases offer easy DIN-Rail mounting. The serial ports support High Speed in RS232 mode, and Very High Speed with RS422 and RS485. All serial ports, USB and DCin provide high ESD-protection. Also available is galvanically isolation with 2.5kV.